Monrovia, Liberia - The President of the Republic, H.E. Dr. George Manneh Weah, has avowed his Government’s continued commitment to the sustenance of peace, free speech and media freedom. He indicated that the enjoyment of press freedom and free speech by Liberians and those within the borders of Liberia is critical to lasting peace and development. 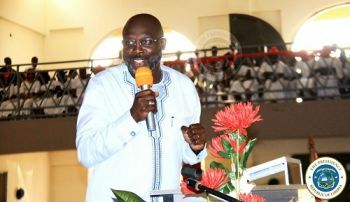 The Liberian Leader made the remarks Tuesday, January 22, 2019 when he and a host of government officials, international partners and supporters converged at the Dominion Christian Fellowship in Monrovia at a thanksgiving program to celebrate his administration first year in office. President Weah was inaugurated January 22, 2018 following his win of the 2017 polls on the ticket of the Coalition for Democratic Change (CDC). Despite inheriting a broken and tumultuous economy, coupled with high public expectation for national transformation, President Weah and his administration braved the odds and successfully made substantive gains during the first year. The administration took a couple of transformative measures that stabilized the money market, provided critical social services particularly for underprivileged communities and peoples and attracted favorable international cooperation and support. Taking the podium to make remarks at the First Anniversary Celebration Ceremonies held under the theme, “We Thank God”, President Weah, beaming with broad smiles, expressed profound thanks and appreciation to the Almighty God for giving him wisdom and courage to lead a nation under precarious conditions. The Liberian Leader expressed his government’s commitment to promoting peace, human rights and national development throughout the Republic of Liberia. He indicated that being grateful to God and paying special homage to him pulled down windows of opportunities. He said the celebration was meant to reflect on the gains and challenges of his Government’s first year in office and to make critical assessment on ways to lift Liberians out of poverty. President Weah asked Liberians to be grateful to God for peace and tranquility and to allow nothing from suppressing their dreams in life. The Liberian Leader noted his Government wouldn’t have made the gains and landmark achievements of the first year without acknowledging God and asking for His inspiration and counsel. Speaking at the program, the guest preacher, Bishop Dr. George D. Harris said it was important for all Liberians to thank God for bringing Liberia to this level through his grace. Bishop Harris said that Liberia was now taking the right step by giving the country to Christ. “It is incumbent upon all Liberians to turn to Jesus and know that this country belongs to Him,” he said.